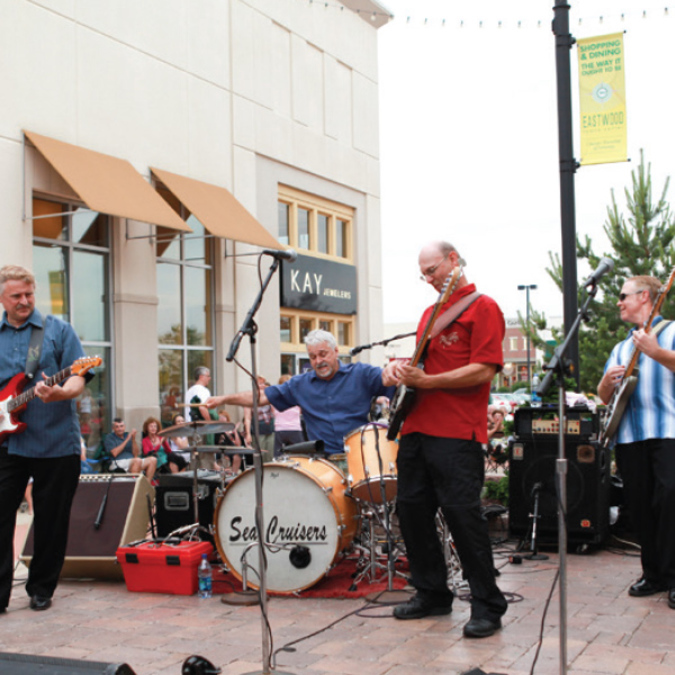 To enjoy the fun summer has to offer while keeping your budget intact, check out the free weekly concerts going on all season at Eastwood Towne Center in Lansing. “Because Eastwood Towne Center is an outdoor-style mall, they take full advantage of the beautiful scenery surrounding the shops by hosting outdoor events,” writes Leighanna Whiting for awesomemitten.com . “... They wanted to create a community event that would bring everyone together as well as being a fun time for all ages, and so the Summer Music Series was born,” Whiting wrote. With a new band performing each week, families can tap their toes to the beat of the music from 6 to 8 p.m. most Tuesdays during the Summer Music Series at Center Court. Originally a four-week event, the series has expanded to 10 weeks because of its popularity. Those 10 weeks include a variety of bands, starting June 14 and going until Aug. 23. The bands cover a variety of genres. The Sea Cruisers and Smooth Daddy specialize in oldies, while Life Support plays contemporary pop. Showdown and Natchez Trace jam out classic rock, and Brenda Loomis is a country act. Layers features jazz, Root Doctor focuses on rhythm and blues, and Don Middlebrook & The Pearl Divers perform Caribbean music. MSUFCU Kids Night on June 28 is a special event from 5 to 7 p.m. that will have entertainment and games with Rock Out Entertainment and prizes for the whole family. There will also be face painting, henna tattoos and a balloon artist. Tim the Music Man will perform from 6 p.m. to 7 p.m. In addition to enjoying free concerts every week, come early or stay late to explore the shops throughout Eastwood Towne Center. Check out The Apple Store, Banana Republic, DSW Designer Shoe Warehouse, J. Jill, J. Crew, Pottery Barn, Sephora, White House Black Market and more. Younger shoppers may like Gap Kids, Gymboree and Justice. The full directory is on the Eastwood Towne Center website . Concertgoers can dine before the shows at one of the many restaurants, or take in dinner and a show by watching the bands perform from the comfort of a table on the patios of Mitchell’s Fish Market or Bravo! Cucina Italiana. Those in the mood for food from home may pack a picnic basket and bring lawn chairs. Mark your calendar for Tuesday nights this summer, and bring the family to these free outdoor concerts for memorable evenings together.